Not too long ago, H. Clayton Cook, in an April 2017 column in this same venue, said, "When it was passed and signed into law during the Bush Administration, the Energy Independence and Security Act of 2007 was hailed as an important and long-sought objective of the U. S. Maritime community. The law was President Bush's extension of the Maritime Administration (MARAD) Capital Construction Fund (CCF) program to container and Roll-on/Roll-off (RO/RO) services in projects in the U.S."
"The act (Merchant Marine Act of 1970) also authorized MARAD to add U. S. shipyards and operators in the SST/AHT coastal and inland waterways trades as CCF Program "qualified vessel" participants." Cook continues, adding, "The 2007 Act gave MARAD the authority to add U.S. citizen shipyards and operators in the SST/AMH coastal and inland waterways trades as CCF Program "qualified vessel" participants. In the decade that has followed, not a single U.S. citizen shipyard, and only one U.S. citizen operator has sought to access this CCF Program opportunity. Why?" Separately, the U.S. Department of Transportation insists that it has a laser focus on "rebuilding, repairing and revitalizing our transportation infrastructure," as well as its mission to preserve and defend America's domestic shipbuilding base. That's all well and good. However, and at the very same time, there are many U.S. flag operators - specifically those in the passenger vessel game - at an enormous disadvantage because today's interpretation of the MARAD Capital Construction Program excludes these operators from all the benefits of this well-intentioned program. Yes, a vessel operator can put income from operations into Schedule A "Agreement Vessel" income. But we will not have a Schedule B "Qualified Vessel," as MARAD will not approve a "pure passenger service," so there is no way to order a vessel utilizing the CCF without a penalty. 46 CFR Appendix I, Part 390 lays this out nicely. MARAD appears to have washed its hands of the matter, saying in effect, "this is a legislative matter, out of our control." Similarly, MARAD has its much-publicized 'designated marine highway program.' But, if CCF rules only help blue water shipping, what's the point of having either the designated marine highways or pushing shortsea shipping at all? 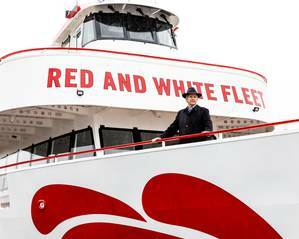 Finally, it should be lost on no one that Red and White Fleet's own, ultra-clean hybrid drive Enhydra is the perfect example of what we could be building to clean up the environment and at the same time furthering shortsea shipping. On behalf of all shipyard workers and all members of the U.S. Merchant Marine we need MARAD's assistance in focusing on this important issue to include all passenger vessel operators in the CCF. It is not in our national interest for MARAD to continue to drag their feet on this important issue. And, yet, the question seems to be: "Does DOT and MARAD truly want to see a newer, stronger U. S. flag fleet or will they just continue to talk about it?" Bringing practical clarity to this CCF topic, it is true that the gross revenue of the Red and White Fleet in relationship to its U.S. flag blue water, deep draft fleet operators is similar in size to "a pimple of the fanny of an elephant," but that fact has no relationship to building a stronger U S maritime industry. And the sooner maritime stakeholders realize that the backbone of the U.S. fleet now rests firmly in the workboat sector, with fully 16 percent of those totals classified as subchapter H, K and T tonnage, the quicker that the CCF can be opened up to a wider swath of its members. And, not a moment too soon.